Back in March we were given a Bootcamp assignment on the Suffragettes. While researching the project I discovered so much I didn't already know about these brave and remarkable women. I had no idea of just how much they suffered in the name of votes for women. Many of them went on hunger strikes while they were in prison and were brutally force fed with tubes being stuck down their throats or even up their nostrils while being physically restrained. The abuse they experienced effected their physical health for the rest of their lives. It is truly humbling to consider the sacrifices these women made for the benefit of all women in Western civilisations today. 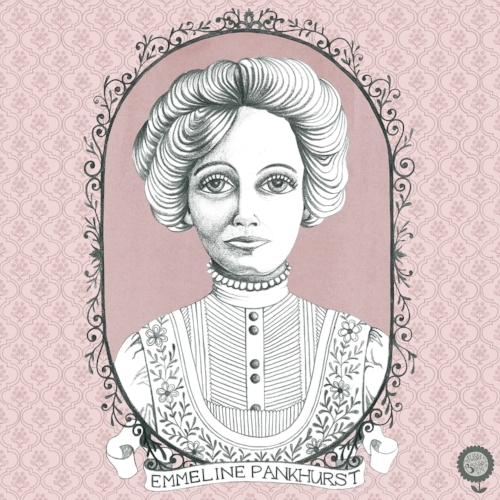 While there were many of these extraordinary women who made up the Suffragette movement, I particularly researched a leading figure: Emmeline Pankhurst who in their desperation to be heard, encouraged militant tactics. She founded the all women political organisation the WSPU (Womens Social and Political Union) in 1905 whose slogan was 'deeds not words'. Against much criticism, she encouraged her members to use extreme measures such as arson. She died in 1928, just weeks before the vote for all women aged over 21 was granted on 2nd July. A memorial of her can be found near the houses of parliament.